A starn is a big baw o gas in ooter space, makkit maistlins oot o hydrogen an a wee bit o helium plus ither elements. The Sun is sic a starn. In the centre, the poust o gravity is sae odious that the temperaturs are heich eneuch for the atoms tae fuse thegither, causin nuclear fusion. This energy huily leaks oot o the starn (ower a few hunder thoosand year in the case o the sun), an by the time it wins at the surface maist o this energy is in the form o visible licht. Maist starns leuk like glazie dots frae the Yird, acause thay are faur awa. Wir Sun is the naurmaist starn tae us. The yird muives aroond (orbits) the Sun in an oval shape. The Sun an aw things that orbit it is cried the solar seestem. Mony ither starns whiles hae planets orbitin thaim an aw. Scientists hae fund ither planets muivin aroond ither starns, but nae planets that thay hae fund are equal-aqual tae the Yird. 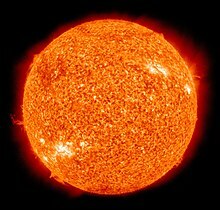 The naurmaist starn tae wir Solar Seestem, an the seicont naurmaist starn tae the Yird efter the Sun, is Proxima Centauri. It is 39.9 trillion kilometres awa. This is 4.2 licht year awa, meanin that licht frae Proxima Centauri taks 4.2 year tae win at the Yird. Wikimedia Commons haes media relatit tae Stars. This page wis last eeditit on 22 August 2017, at 21:57.